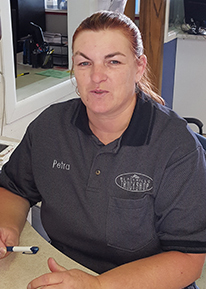 The team members at Black Hills Truck Shop are expertly trained to diagnose and repair your vehicle. Our staff has the skill and experience to perform all sorts of auto repair services from steering and suspension to electrical troubles to engines and transmissions. If you have any questions or concerns, please feel free to ask one of our staff members for help. We are Now Accepting Job Applications! If you are a knowledgeable and skilled auto technician, then we just might have a job for you. Fill out a job application and email it with your resume to rick@bhtruckshop.com. 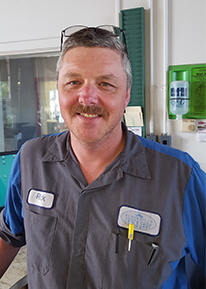 Rick has lived in Rapid City since 1991 and graduated from Western Dakota Technical Institute in 1995. He has 22 years of experience in the automotive/truck field with 18 years of that working in a Ford dealership and started specializing on Ford diesel engines in 2005. He held Ford’s Senior Master certification for 10 years and was the 2-14 winner of the Ford PTS Performance Challenge for the Denver region. Petra was born and raised in Germany. At a young age she started in off-road racing and enjoyed it until her move to the US in 1987. She was a Military Spouse for 23 years and moved all over the US as well as Europe. Now she enjoys the ranch lifestyle and riding her bike through the Hills in her off time. we offer the Best Truck Repair Services in the Black Hills area! Copyright Black Hills Truck Shop © 2019. All Rights Reserved.